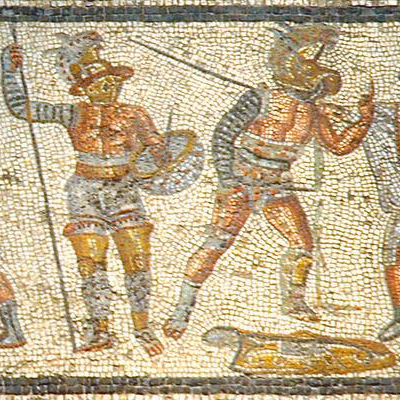 Kathleen M. Coleman cleared up misconceptions about the Roman gladiators at this year’s annual J. Reuben Clark III Lecture in Classics and the Classical Tradition. PROVO, Utah (Mar. 31, 2016)—The gladiator is a powerful image in modern culture, and a violent one at that. Films like Spartacus and Gladiator have cemented the Roman warrior as a bloody figure in the public consciousness, and the colosseum as deathtrap. The two are often pointed to as evidence of mankind’s progress from a barbaric past into a more enlightened age, where such exploitation would never go publicly condoned. According to tradition, the first gladiator match took place not in the Colosseum, but at a graveside 264 BC, as part of a funerary celebration. Though originally memorial in nature, gladiator matches became more commemorative over time, eventually becoming a political tool. The tradition sprouted of hosting matches in order to commemorate occasions such as the emperor’s birthday or other civil events. But even that commemorative nature gave way to the sheer spectacle that gladiators had to offer. Why were rulers so eager to expend their resources on these public events? “They get glory out of it. Glory and a following,” Coleman said. Rulers who hosted these matches easily gained the respect of their subjects; on occasions when citizens praised their rulers, they made specific mention of the games they had hosted and the details of the matches. This complicates one of the most popular images of the arena: a gladiator stands over his opponent as the crowd shouts out for the loser’s death, only for the regent to confirm their demands with a thumb pointed down. In reality, the arena was a much more tightly controlled area than that. Many battles were actually dramatizations, the fights themselves were highly disciplined, complete with a summa rudis, a senior referee who ensured that everything was done to regulation. And entering the arena wasn’t nearly the death sentence that films make it out to be. “It’s generally believed that 10 percent of combat may have ended in a fatality, which means that five percent of gladiators, since there were two fighting, would have died,” Coleman said. When the moment came for the loser’s fate to determined, 95 percent of losers were reprieved – in other words, allowed to live.